Yes, that's Kristine Lilly in a Temple jacket. 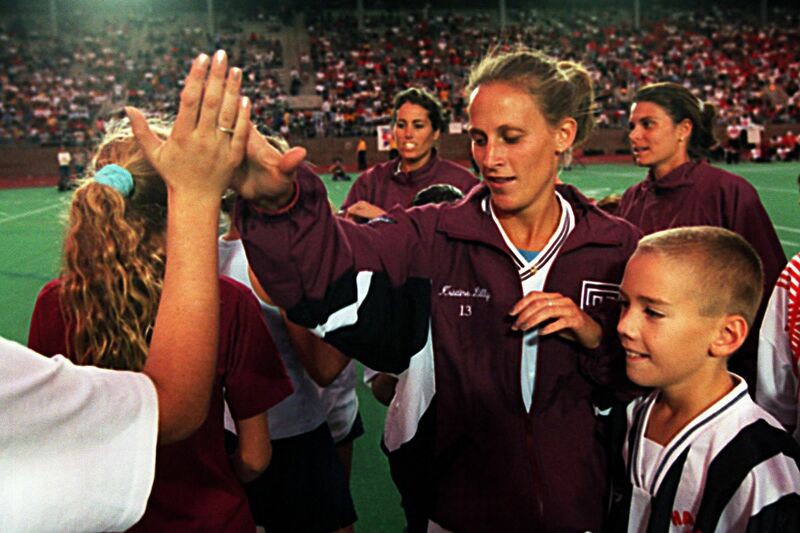 A few months after the U.S. won the 1999 World Cup, she came to Philadelphia with Julie Foudy and Mia Hamm (in the background) for a soccer clinic held before a Temple football game at Franklin Field. Kristine Lilly insists to this day that she wasn’t a very good header of a soccer ball as a player. Her former U.S. national team colleagues disagree, and for good reason: they were right in front of Lilly when she leapt into the air to make a goal line clearance in the 1999 World Cup final that saved the game for the Americans. But Lilly is sure of it. “I’m a terrible header," she said during a recent panel discussion with teammates from that legendary day, hosted by the organizers of the International Champions Cup. Whether or not she’s right, there’s little else that Lilly — Lilly Heavey, officially, though she often uses her maiden name in public — couldn’t do. She is the U.S.' No. 3 all-time goal-scorer, and No. 4 worldwide behind Abby Wambach, Canada’s Christine Sinclair, and Mia Hamm; and ranks No. 2 in assists behind Hamm (the rest of the world doesn’t track the stat the way the U.S. does). She won the World Cup in 1991 and 1999, and the Olympics in 1996 and 2004. And she holds an international record that is likely to stand forever, for the most national team caps by any man or woman: 354, from 1987 (when she was 16) to 2010. The men’s record is 184, and Sinclair (age 35) and Lloyd (36) are the only active women with over 200. These days, Lilly leads a mostly private life in suburban Boston. She is still involved in the sport as a youth soccer coach, an age group she enjoys working with, and occasionally as a TV analyst. As for the current generation of U.S. players, Lilly is impressed by her successors in the midfield. Kristine Lilly in action for the U.S. women's soccer team during a game against China in the 1996 Olympics. Lilly especially likes Heath’s calmness on the ball, a contrast to the U.S. team’s long history of fast-paced, athletic soccer. When it comes to this summer’s World Cup, Lilly left no doubt that she wants the Americans to repeat as champions. And she knows her former teammates feel the same. But she knows as well as the rest of the world does that it won’t be easy.